The public is invited to take a guided walk alongside the St. Marys River and learn about proposed riverfront development concepts. Local architects will take part in the walks and sketch people's ideas for what they envision along the downtown riverfront. • October 6 from 5:30-7 p.m.
• October 7 from 11:30 a.m.-12:30 p.m. 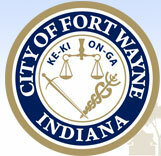 The City of Fort Wayne's Office of Housing and Neighborhood Services wants to know how citizens think Federal dollars should be spent. Residents are invited to express their opinions at a public meeting on Thursday, September 25 at 6 p.m. at the Parks and Recreation Community Center, 223 W. Main St., Room 201. Input received from the public will be included in the Annual Action Plan that the Office of Housing and Neighborhood Services submits to the U.S. Department of Housing and Urban Development, or HUD. All HUD dollars must be spent to improve the quality of life for low- to moderate-income residents. (Ottawa, ON Canada.) – The International Downtown Association (IDA) today honored the City of Fort Wayne and Indiana University-Purdue University Fort Wayne (IPFW) with a Merit Award for the IPFW Sculpture with PurposeTM project. During the IDA's annual conference in Ottawa, Ontario, the IPFW Sculpture with Purpose effort was recognized for its contribution to beautifying downtown Fort Wayne, making art more accessible and promoting bicycling. IPFW Sculpture with Purpose won in the category of Public Space. This category recognizes capital improvements that enhance the urban design, physical function or economic viability of downtown and the community. Area residents will have a chance to see how a protected bike lane works at the North Anthony corridor block party September 7, 2014. The block party takes place on North Anthony Boulevard between Crescent Ave. and St. Joe River Dr. from 2 to 8 p.m.
City planners will demonstrate a protected bike lane during the block party and talk to neighborhood residents about whether they like the concept. The City's Bike Fort Wayne plan calls for some type of bike facilities to be installed along the North Anthony corridor, possibly in 2015. Mayor Tom Henry today announced his appointments to the Legacy review committee. Under the Legacy review process approved by City Council earlier this week, a nine-member committee will be responsible for reviewing requests for Legacy funding. The committee is comprised of three members of Mayor Henry's administration, three members of City Council, and three citizen members (one selected by the Mayor, one selected by City Council, and one selected by the committee). The committee is designed to enhance the City's Legacy initiative.